Open Outlook, then select File. Select POP or IMAP then click Next. On the Outgoing Server tab, check My outgoing server requires authentication. On the Advanced tab, enter the server port numbers and then click OK.
Click Next. 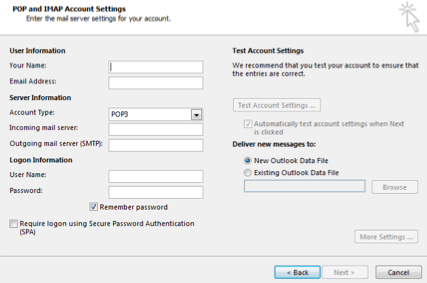 Outlook will test the account settings and confirm set up. If you are using another version of Outlook, click here for instructions.